Gennaro Sarnelli was born in Naples, Italy, on September 12, 1702. Son of the Baron of Ciorani, he had a solid cultural and spiritual formation. Dedicating himself to the study of jurisprudence, he gained a doctorate in civil and canon law at age 20. Caring for the sick in the Hospital for the Incurables, he felt the call to the priesthood. During this time he also came to know Alphonsus Maria de Liguori, who was his first biographer. Ordained a priest in 1732, he dedicated himself especially to the catechesis of young boys and to the rehabilitation of girls at risk of becoming prostitutes. In June of the following year, he entered the Redemptorists. He dedicated himself to the preaching of the Word of God to those who were most destitute of spiritual help. For reasons of health, in 1736, he returned to Naples, where, while continuing the missionary activity of the Redemptorists Congregation, he resumed his previous pastoral and charitable activities, especially among the sick, the old, those in prison and the young boys forced to work as dock-laborers. He also initiated a fervent movement against the spread of prostitution. A prodigious writer, he published more than 30 books on a wide range of subjects, including socio-juridical studies, moral issues, mysticism, pedagogy, pastoral practice, Mariology, and ascetical theology. 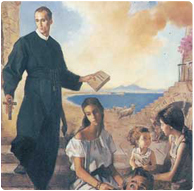 In 1741, he organized and took part in the great mission among the spiritually abandoned areas in the outskirts of Naples. Spent by his burning zeal, he died in Naples June 30, 1744, at the age of 42.